If eating healthy is high on your priority list, then you may have heard of quinoa. It's the super grain that can be substituted for rice or pasta to make a ton of fun and healthy recipes. Quinoa can be eated at almost any meal of the day. In this compilation, we've collected amazing lunch and dinner recipes. But don't worry, we've also included a few tasty quinoa desserts to satisfy your sweet tooth. Here are 15 Healthy Quinoa Recipes that all use quinoa, so your adventures with quinoa can now begin! We hope you enjoy cooking these healthy quinoa recipes. It'll be hard to decide which healthy quinoa recipe to try first! Looking for low-calorie meals? Then, you'll love this eCookBook full of Healthy Low-Calorie Recipes. Detox Salad - If you feel like your body needs a bit of a boost, then the Queen of Quinoa's Detox Salad is sure to do the trick! What makes this detox salad recipe so invigorating is that it incorporates nutrient-rich ingredients such as kale, blueberries, almonds and kelp powder. The salad dressing recipe is simply a combination of rice vinegar, lemon juice and real maple syrup, meaning the natural goodness of the veggies shines through in this simple salad recipe. Get your healthy lifestyle back on track with this all-natural detox dish. Easy Quinoa Wraps - Chinese food is a staple in America. Because of this, so many of us crave it. But, sometimes we battle decisions like choosing between deep-fried egg rolls and other dishes with high-sodium sauces. Well, choose no more! With this recipe for Easy Quinoa Wraps, you can satisfy your Chinese food craving and still feel good about it. This easy, healthy recipe is packed with natural ingredient like quinoa and kale, but also our adored soy sauce. You're going to love this one. Dark Chocolate Cookies - Just when you thought desserts would never fit into your healthy eating plan, these genius Dark Chocolate Cookies come into your life and open up a whole new world of sweet delight. How can it be, you ask? Well, these cookies are filled with quinoa, a nutritious grain that substitutes the flour in most other cookie recipes. In addition to the quinoa, these cookies also use dark chocolate instead of milk chocolate. This is a substitute that can save you from extra calories. So, don't fret, these cookies will be the healthy dessert recipe your sweet tooth has been asking for. Basic Quinoa Salad - For a tasty salad that is super healthy, put this Quinoa Salad on your list of gluten free foods that you eat over and over again. This easy salad recipe is a surefire success. It'll please all of your friends and family, so they'll be begging you for this yummy salad recipe. Homemade Chipotle Burrito Bowl - Restaurant copycat recipes are a great way to enjoy your favorite restaurant food items at a fraction of the price. This recipe for a Homemade Chipotle Burrito Bowl with Cilantro-Lime Quinoa shows you how to replicate one of the most popular Chipotle restaurant recipes at home. However, you won't find any rice in this recipe. Instead of white rice, this dish uses protein-rich quinoa. Greek Quinoa Casserole - If you are looking for one of the most wholesome healthy casserole recipes that fits into your healthy eating plan, then make this easy Greek Spinach Quinoa Casserole. Chock full of the very best ingredients and flavors, this Greek-inspired dish to bound to please. Best of all, this quinoa recipe can be on your list of gluten free recipes. Veggie Salad With Balsamic Vinaigrette - How pretty is this simple salad recipe? Luckily, it's just as delicious to eat as it is beautiful to look at. With just 2 main ingredients, this Veggie Salad With Balsamic Vinaigrette can come together and be the vegetarian show stopper of the season. Lightly marinate the cauliflower florets and mushrooms, then roast on a shallow baking sheet until just caramelized. When it's warm, you can also throw these veggies on the grill. In either case, you can serve this dish hot or cold. This is possible the least expensive salad recipe ever. Light Quinoa Salad With Avocado - This is a must-try, healthy vegetable recipe that will make your mouth water. This easy quinoa salad recipe has a variety of mixed veggies that are grilled to perfection. It makes for a great weeknight dinner. Its light taste makes for the perfect summer salad when you want to eat healthy. You cannot go wrong making this quinoa salad because it is full of color and nutrients. Don't hesitate and eat the Light Quinoa Salad with Avocado for your next meal. Quinoa Stuffed Cabbage - Your typical easy stuffed cabbage recipe usually features lots of red meat. This Quinoa Stuffed Cabbage recipe makes things lighter by stuffing the cabbage with quinoa, a grain-like seed that is loaded with healthy amino acids. If you've always wanted to try cooking quinoa, then this cabbage recipe is the perfect recipe for you. No-Bake Peanut Butter Bars - You will love these No-Bake Peanut Butter Bars that are filled with protein and creamy peanut butter. They are easy to make, so they're the perfect snack. You will love making the hassle-free bars that require very little time to make. Their taste is out of this world, and this healthy recipe works great as a power bar. They are so tasty you will not even notice that you’re eating healthy. Start snacking lighter by making these delicious sweet treats. Watermelon Mint Quinoa Salad - Not much beats crisp, cool watermelon on a hot summer day. This Watermelon Mint Salad With Quinoa takes the idea of a classic fruit salad and adds a gluten free flare. Try this light meal the next time the sun is beating and hunger strikes. Spinach & Feta Quinoa Salad - Salads are great for one pot meals. Use just your sautee pan to make this deliciously nutritious Spinach and Feta Quinoa Salad. It might be a low-cal recipe, but it's definitely not low in flavor. Vegan Peanut Butter Chocolate Cake - Who would have thought quinoa could take on the taste and smell of peanut butter without all the calories? This Vegan Quinoa Peanut Butter Chocolate Cake recipe offers the most decadent flavors without the guilt. Learn how to make gluten free quinoa flour for this low-fat chocolate cake. Mushroom Quinoa Risotto - This easy-to-make risotto is perfect for a light dinner. Its fresh taste of veggies mixed in a creamy risotto and quinoa will satisfy you and your family. This is a great healthy mushroom quinoa risotto that is full of natural flavors. This easy risotto recipe could even be used as a side dish for your next meal. It's so good that you won't want to wait. You should try making the Mushrooms Quinoa Risotto today. Mexican Quinoa Salad - This Mexican Quinoa Salad is filled with protein and other great nutrients. It is the perfect salad for a lunch or a weeknight dinner. You'll love that this is an easy quinoa salad that is filled with vegetables. It's so delicious and colorful. Eating this Mexican salad is a great way to start having a healthy diet, and the best thing about this salad is that it is so full of flavor that you will not even realize you’re eating healthy. Make a healthy salad recipe for your next meal. Want even more quinoa recipes? Check out these 29 Cooking with Quinoa Recipes! I love the idea of using quinoa in desserts! Woah, those Dark Chocolate Cookies are healthy?? That's awesome. 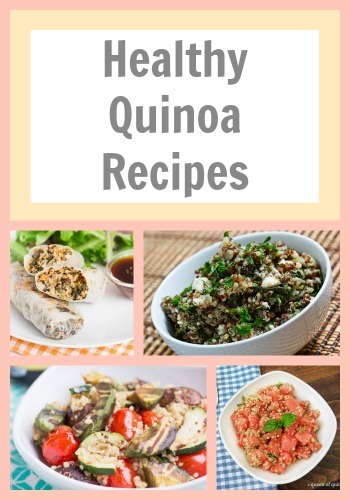 I've always wanted to try cooking with quinoa, and after reading these I definitely will give it a go! !